Good Morning Monday! Today I have the worlds most epic post on healthy eating in Manila all thanks to my friend, Pam Siao of Green Lunch Diaries. I met Pam a number of years ago (yes, of course through Instagram) and was intrigued as to how she could find the health alternative to any meal of any cuisine. Not only does she have wonderful taste but her creativity with healthy food is monumental and something I want to share with my community. Many foreigners arriving in Manila say one of the hardest task of settling in is simply finding what it is they are searching for, look no further, we have brought healthy eating TO YOU! Maraming salamat po Pam! Healthy eating may mean different things to different people. Some may define it as plant based, low fat, low carb, low sugar, or low calorie. But the definition that makes the most sense to me, is simply to eat food that is as close to its natural state as possible, as often as possible. It’s become a lot easier to eat clean while living in Manila, and the best way to eat clean is of course to prepare or cook the food yourself. There are farmers’ markets and weekend markets to go to, vegetable basket subscriptions, and smaller shops that focus on whole food. But even supermarket chains carry organic brands and better whole food choices now. For breakfast, you can have native chicken eggs; oats caldo (arroz caldo made with rolled oats); a yogurt parfait (try Pinkie’s Farm) made with local yogurt, homemade granola, and fresh fruit; or local fruit smoothies/smoothie bowls (try Guimaras mangoes or local dragonfruit blended with frozen bananas and buco juice). For lunch and dinner, local vegetable dishes are the best! My favorites are pinacbet, monggo stew, laing, gising gising, lumpiang gulay, and mushroom bistek. Other simple, homestyle Filipino dishes to try are arroz caldo, adobo, chicken inasal, beef tapa, daing na bangus, chicken tinola, pork barbecue, kare-kare, and arroz ala cubana. If you’re fortunate enough to have a Filipino cook in your employ, I’m sure she already knows how to make all these, but you can also find easy Filipino recipes on websites like Yummy.ph, Panlasang Pinoy, Kawaling Pinoy, and Astig Vegan (for veganized versions of Filipino recipes). And for maximum enjoyment, don’t forget to pair your meals with sides and condiments like salted duck eggs, atsara (local pickled vegetables), fresh calamansi (local lime), and spiced vinegar. In between meals, you can enjoy local snacks like boiled or fried Saba bananas, airfried camote fries (sweet potato), gabi or cassava chips, roasted kasuy (cashew) or pili nuts. You can also treat yourself to uniquely Filipino fruit, like Indian mango, jackfruit, mangosteen, sineguelas, macopa, atis, guyabano, pomelo, and star apple – all of which are delicious, and such a treat whenever they are in season. When cooking traditional Filipino recipes like adobo and beef steak, for example, we try to use healthier versions of the usual ingredients. Liquid aminos instead of soy sauce, apple cider vinegar instead of suka or patis, raw honey or muscovado instead of sugar, no-sugar peanut butter instead of the sweetened kind, coconut flour instead of all-purpose flour, adlai, quinoa, rolled oats, or red/brown/black rice instead of white rice, etc. We have a lot of purveyors now and it’s easy to find things like vegan versions of everything from cheese to bagoong! To make clean eating even simpler, I often rely on this simple formula: local vegetables + wholesome grains. It takes 15-20 minutes to prep and cook a big batch of monggo, laing or pinacbet, and all you have to do is serve them in a bowl over wholesome grains such as adlai, heirloom/mixed grain rice, quinoa, caulirice, or even rolled oats. Inihaw is the perfect option when getting together with friends. Simply fire up your grill (outdoor or tabletop) and prepare a spread of seafood, meat, vegetables, and even fruit. Our favorite healthyish things to grill include squid, prawns, bangus, chicken, corn on the cob, pineapple, and saba bananas still in their skin. Don’t forget to prepare lots of sides and condiments like a green mango and salted egg salad, pako salad (seaweed), atsara (local pickled vegetables), toyomansi, spiced vinegar, and calamansi (local lime). You can also serve pitchers of ice cold buco and dalandan juice, and serve Guimaras mangoes for dessert! Coconut water or buco juice is a big deal to me – not only is it refreshing and delicious, it’s also rich in nutrients, antioxidants, and natural electrolytes. It’s basically my favorite drink on earth, and being able to enjoy it year round is definitely one of the #PerksofthePines. I used to buy buco juice once or even twice a day from those carts you see in a mall, till I found out that practically all of them add some sort of sugar to their buco juice. I found this out quite by accident. I was chatting with my suking buco juice vendor and saying “Ang sarap talaga ng buco juice, kahit walang sweetener no?” (Coconut water really is so good even without sweetener) And I saw her hesitate, with a guilty look on her face. She had told me once before, as a new customer, that they served pure unsweetened buco juice, but I guess she suddenly felt some guilt because at that point, we would talk to each other almost everyday. She told me that she doesn’t do it herself, but their commissary adds a little bit of sweetener to the coconut water to make it taste better as well as last longer. She told me all the carts do it. After that, I started grilling all the buco juice sellers I saw at the mall, telling them I’m really not allowed to have any sugar, and almost all of them admitted that their coconut water had some sort of sweetener added to it. After all my research, I can recommend two suppliers that I trust to have no added sugar in it – Kajuayan (@kajuayan), because I checked with the owner multiple times, and they bank their reputation on it; and Coconut Republic (at Shangri-la Food Court), because they crack their coconuts open and bottle the juice onsite. This being the Philippines, you can also find yourself a buco dealer and buy your coconuts whole at a fraction of the price. BERDE BOWLS – Filipino salad/grain bowls with fresh ingredients sourced from partner farms. My favorite lunch place, and absolutely delicious! MANAM – Try the alugbati salad with kesong puti (alugbati is a local superfood leafy vegetable and kesong puti is a delicious Filipino cheese); other healthyish dishes on the menu are the lumpiang ubod, gising gising, adobong kangkong, pako salad, inihaw na pusit, and watermelon sinigang. SENTRO 1771 – The galunggong fillets and corned beef singang are our favorites. And if you must have sisig, Sentro uses organic pork to make this signature dish. YOUR LOCAL – While not a Filipino restaurant, Your Local is one of my favorite restaurants in Manila and I just had to include it in this list. Try their torched salmon donburi, tofu steak and eggs, chicken rice, eggplant appetizer, and pomelo salad. EARTH KITCHEN – A farm to table restaurant that supports marginalized communities and indigenous farmers around the country. My favorites are the fresh mushroom soup, spring rolls, soft tacos tacos, watermelon salad, and kebabs. GREEN PASTURES – This restaurant uses all local, organic ingredients, sourced from “people who follow farming techniques that protect the environment and the community.” Try any of their salads, quinoa and adlai bowls, and caulirice bowls – all really good, albeit on the expensive side. They also have a variety of levelled-up local dishes on the menu, such as gluten-free Bibingka, Duck ala Cubana, Sous Vide Chicken Inasal, and Jackfruit Kare Kare! CORNER TREE CAFÉ – A vegetarian restaurant that serves simple, comfort food. Try the Arroz ala Cubana, Adobong Tofu, and Kare Kareng Gulay. Farmers’ Market in Cubao is our go-to, and we really enjoy weekend markets such as the Salcedo Market on Saturdays and Legazpi Market on Sundays. My father-in-law goes to the Cartimar Market in Manila, and always sends us fresh shitake, polunchay, and other goodies from there. Good Food Sundays at Mandala Park is a treasure trove of vegan/vegetarian finds, and I’ve heard the Greenhills weekend market also has a good selection of meat, seafood, and produce. But even if you don’t have time to go to the markets, many large supermarket chains already have a wide selection. I buy vegetables from Organicus, organically grown salad greens, spinach, and kale from Salad Time by Basic Necessities, and native chicken eggs from CLDA in SM. You can get hormone-free, antibiotic-free chicken from Holy Carabao, Backyard Farms, Healthy Options, or even Unimart, and grass-fed meat from Down To Earth Organics. And Fishmongers Daily Catch partners with local fishmerfolk to deliver fresh seafood to your home within 24hours from catch, guaranteed. For hard-to-find ingredients, I also go to Healthy Options, S&R, and Landers, and I love small shops like Real Food, Gourmet Corner, and Ritual. The Vegan Grocer stocks everything you need for your vegan kitchen, and they deliver via Lalamove. And there you have it, a plethora of healthy eating options right here in Manila! 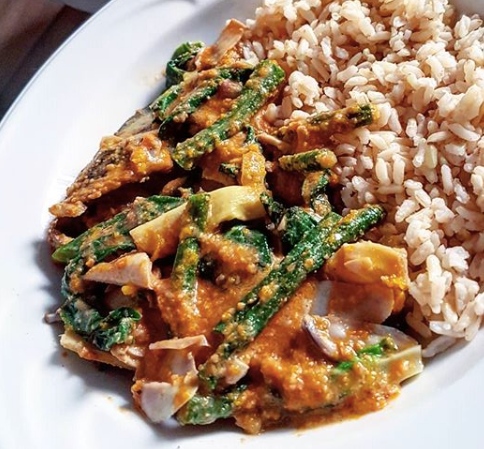 I used Pam’s suggestions about vegetable dishes to try this weekend while at a beach resort and it was THE best food we’ve eaten while traveling in the Philippines and I am convinced it’s because I knew what dishes to try. I hope this gives you more confidence in Filipino food and leaning into life a bit more here. 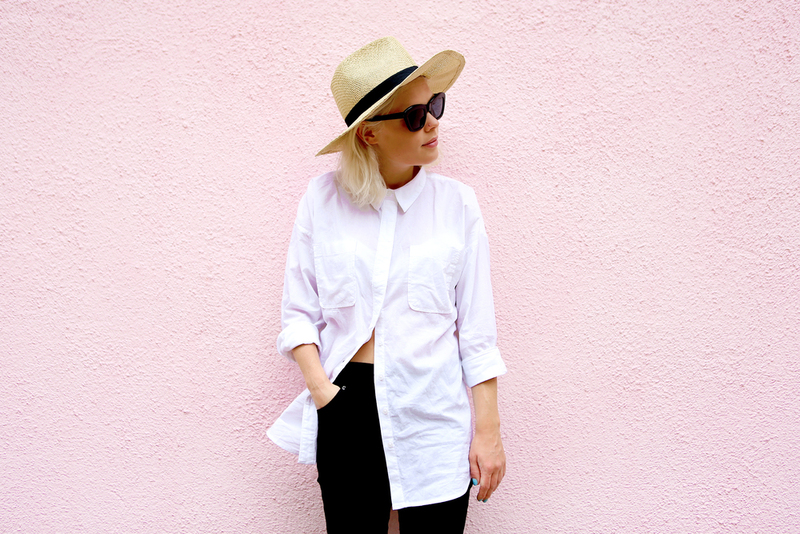 Check out more from Pam at @greenlunchdiaries and her clothing line @willowph. Maraming salamat Pam for sharing your wealth of knowledge. Nov 13 How Bizarre, How Bizarre: A List of Too Many Bazaars For You! Sep 1 Little Lessons On Becoming Filipino: Pasalubong Pa More!